Australia is the world’s third most popular destination for international students. China, India, Malaysia, Nepal and Vietnam make up our top 5 source countries. With over 550,000 international students studying in Australia in 2016, international education is Australia’s third largest export market after coal and iron ore. The growth in international education is very positive – in fact it’s one of five super-growth sectors in Australia alongside agribusiness, tourism, gas and wealth management. Australia’s commitment to grow this market is articulated in the Federal Department of Education’s National Strategy for International Education 2025. States and territories also have their own international education strategies - as do an increasing number of schools across the country. Around 15,000 of our international students currently attend Australian primary and secondary schools. These students come to Australia with deep expertise of their own culture – ways of thinking, ways of doing and, of course, languages. They provide a great opportunity for Australian school students to build global engagement and learning about the world. International students can create interest in and support language learning, widen local students’ perspectives about the world, deepen their knowledge and strengthen intercultural understanding. Research by the International Education Association of Australia shows employers hire international graduates because they are the best candidate for the job (66%), recognising benefits such as a more global perspective (53%), a multi-lingual workplace (42%), new skills (30%) and a stronger work ethic (29%). Departments of Education and schools widely promote the academic and personal benefits for international students studying in Australian schools. However, in most cases, international students are not necessarily seen as an asset to a school’s broader learning experience. 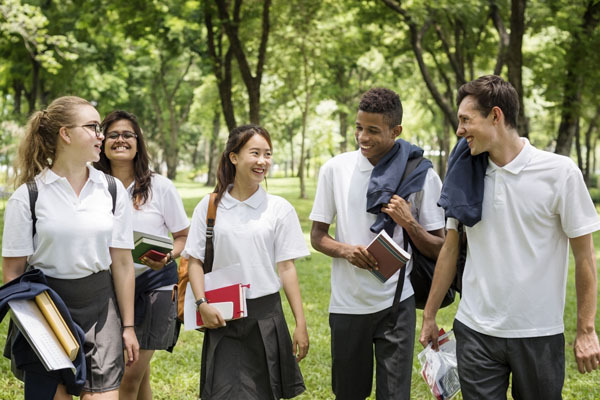 There is little practical advice for Australian primary and secondary schools on how to best integrate international students across their community and the learning opportunities this brings to the whole school community. The Foundation for Young Australians recently released The New Work Smarts report. This shows that by 2030 young Australians will spend more hours learning on the job, an increase of 30 per cent from 2016. To do so they will need to be equipped with the ‘right’ skillset that will provide them with the foundation to ‘succeed in an automated and globalised workplace’. Young people will need to be prepared for a career of lifelong learning and have strong communication skills to be able to interact with a diverse group of co-workers. International students in Australian schools can contribute to building this global competence for all Australian students. Support on how to engage international students in building global perspectives is required for schools to achieve this. To begin with we need to move away from perceptions of international students as business opportunities, to deliberately working to create the opportunity for real engagement with the school community and shared learning. Underpinning this need is the reality that a global mindset and skill set aren’t just required to engage with the world outside Australia. The 2016 census data shows Australia itself as increasingly becoming a more diverse nation. 1 in 5 Australians speak a language other than English at home, and China and India are ranked 2 and 3 after the United Kingdom on immigration. The need to be more globally minded within Australia is just as acute a need as engaging with the wider world. The Australian Curriculum’s Asia and Australia cross curriculum priority and intercultural understanding general capability are definitely a step forward in ensuring global competence for Australian students if they are applied comprehensively in schools. But there is still a lot of work to be done to achieve this if all young Australians are to leave school ready for a globally engaged Australia and the global careers of the future. It simply makes good sense to see our international students as a key partner in achieving this. Register your interest in a 2018 Australia-Asia BRIDGE School Partnership Program.